Dr. Hitchcock: I would like to say first of all that cashless is not a description of our bank accounts, if you copy. Some people read that and think, "Hey, that describes pretty well where I feel where I am right now!" The idea for writing my book Cashless came as I was seeing all the things that are happening in our world today. As you know, Bible prophecy teachers have been saying really since the 1970's that a cashless society is coming. There have been some books written in the past on the topic, but there have been so many things happening in recent times about this, especially with advances in technology. I thought it would be great to kind of give an update on this economic movement. While I was working on the book the financial tsunami in the last of Fall 2008 hit. That event put a lot of this whole movement towards globalism and economic cooperation between nations on fast forward. 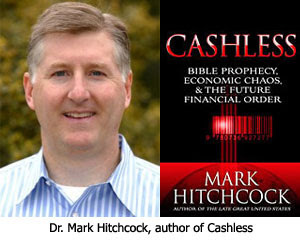 I was amazed that while working on the book all of these things happened and that they are really going to speed up the fulfillment of this prophecy concerning a cashless world society. Such a divine timing on my work feels like God's providence. Dr. Hitchcock: An important point that I like to make is that the Bible never specifically says anywhere there is going to be a cashless society in the future. But, in Revelation 13 the Bible says that this "beast coming out of the sea" whom we call "Antichrist" — this final world ruler — when he comes on the scene is going to have a man who is kind of his second-in-command and propaganda expert. This "beast coming out of the earth," I call him the "World Economic Czar." In the Bible he is also called the "False Prophet." He is going to set up a system where everyone in the world is going to have to worship the Antichrist and take his mark in order to be able to buy and sell. Now, with cash people would not be able to control the world economy, because as long as there is cash people can operate outside of the system by slipping some money under the table. For there to be an iron-clad system where you cannot buy or sell — that absolute supply and demand are controlled — it is going to have to be a cashless society. So, Revelation 13 is where I find the cashless society alluded to in the Bible, and many other prophecy teachers have agreed that's what Revelation 13 means. Dr. Reagan: As far back as I have intensely studied Bible prophecy, which would go back to the late 19th Century (not that I was alive then, but I read books from back then), I have found people saying there is going to be a cashless society in the future. This is not some new prophecy, nor is it some new interpretation. It's not something that you are just reading into the news. This is something that people have been saying long before you came on the scene. Dr. Hitchcock: That's right. Edward Bellamy wrote his book Looking Backward in the late 1800's. In 1887, Bellamy was a utopian writer who predicted credit cards as well as a cashless society. This idea, then, has been part of the secular fabric of our society. Dr. Reagan: Revelation 13:16-17 goes, "He also forced everyone, small and great, rich and poor, free and slave, to receive a mark on his right hand or on his forehead, so that no one could buy or sell unless he had the mark, which is the name of the beast or the number of his name." And so, if one can't buy and sell unless they have this mark, then every transaction in the world has to be monitored, right? Dr. Hitchcock: That's right. Society will have to be cashless using some type of electronic system for that to be true. Very true, and they will jump for it even more if "it" can be "personalized" somewhat.....like "skins" that they have for my insulin pump, or for cell phones and such. .......not suggesting that "it" will be something removable, or portable, was just speaking of "personalizing" the mark in general for each person, whatever the mark ends up being. Just wanted to make that clarification. Revelation 11:18 refers to nations which have destroyed the earth: 'And the nations were angry, and thy wrath is come, and the time of the dead, that they should be judged...and shouldest destroy them which destroy the earth.' The report, 'Heeding Bible Prophecy: Understanding the Book of Revelation' http://watch.pair.com/prophecy.html reveals that the occult plan for the New Age is to go *back to the future* -- to revert mankind to the pre-flood days of Noah and ultimately to the Garden of Eden."